Breakthrough Design. Created with a strong and tough reinforcing fabric which delivers a consistent fastening during the installation. 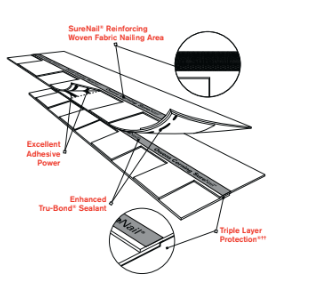 Triple Layer Protection.® A durable “triple layer” of reinforcement occurs when the fabric overlays the common bond of the shingle laminate layers that provides a strong fastener holding power. Superior Adhesion – Our enhanced Tru-Bond® sealant grips tightly to the engineered fabric nailing strip on the shingle below. Excellent Adhesive Power. Specially formulated, wide adhesive bands help keep shingle layers laminated together. Exceptional Wind Resistance. Engineered to deliver 130-MPH* wind warranty performance with only 4 nails!